The GMCF-10 10G30B has no configurable options. The GMCF-10 10G30B is supplied in boxes or bags. Please see handling & storage specification for more information on how filter pairs are supplied for these products. 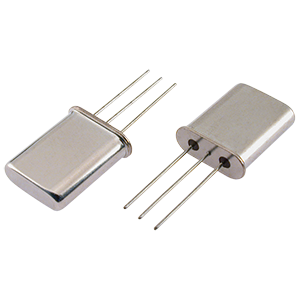 Featuring insertion loss of just 2.5dB, the GMCF-10 10G30B 4 pole crystal filter from Golledge with centre frequency of 10.7MHz. Featuring a 30kHz 3dB bandwidth, the GMCF-10 10G30B is available in industry standard HC49 style package. You can find full specifications here. To request a quotation for the GMCF-10 10G30B please use the configurable options form to choose the options you require and then submit your configured product to our team. Our expert advisers are always happy to help with your requirements and can be contacted on +44 1460 256 100 or at sales@golledge.com. Our GMCF-10 10G30B is included in the following design libraries. Click to download the library of your choice. 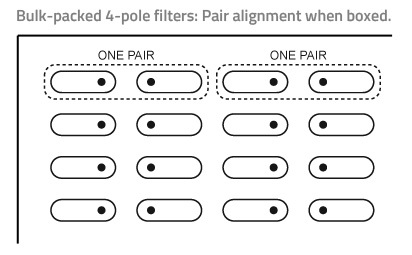 These filters are individually matched pairs. One filter is composed of two physical units, which have been factory-matched for optimum performance. DO NOT MIX. Unmatched pairs will offer impaired performance. For filters supplied in boxes, please refer to the above diagram. Matched pairs may also be supplied in individual bags.